Le Clos Joliette is a producer with an almost obsessive cult following. Whilst many might have never heard the name, I bet there are one or two readers going wobbly at the knees at the mere mention of this “unicorn” estate. I dislike that term. Yet Clos Joliette is certainly an enigma. There is a dearth of information on the internet and hardly any professional reviews, yet mature bottles are highly coveted and do not come cheap. 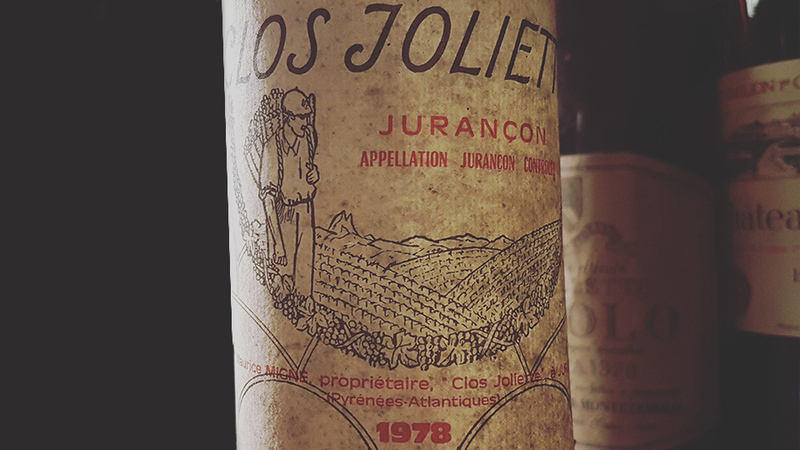 Le Clos Joliette is located in Jurançon: 1.8-hectares of Petit Manseng planted way back in 1929. The terroir is very special, and sits within a southeast-facing amphitheater in the foothills of the Pyrenees. The wine is matured in used oak for three or four years, apparently sourced from Château de Fargues in Sauternes. There are two cuvées, dry and sweet, and though it was not stated on the label, this must have been “Moelleux”. For many years Clos Joliette was owned by Parisian caviste Michel Renaud who sadly passed away in 2015. Since Renaud’s family did not want to continue tending the vineyard, it is difficult finding information whether a buyer was found. I hope so.